We manufacture a variety of superior quality polyester webbing. Our polyester webbing are made with the objective of providing strength, extra protection and safety to the passengers. The belts can be customised in terms of width, designs, patterns and weaving to enable use in other industries. We are one of the leading manufacturers and supplier of Polyester Niwar in Mumbai, India.We manufacture a variety of superior quality polyester Niwar. Our polyester Niwar are made with the objective of providing strength, extra protection and safety to the passengers. The belts can be customised in terms of width, designs, Patterns and weaving to enable use in other industries. We are offering a wide range of Tubular Polyester Webbing.Tubular Polyester Webbing is made from 100% Polyester. This heavy-duty webbing is super strong, abrasion resistant, and UV resistant. Ideal for sail making applications, sail ties and jack lines. Polyester webbing is commonly used because of its superior strength. It combines the benefits of nylon and polypropylene webbing to create a webbing that is strong enough to withstand heavy loads. Polyester webbing's strength is part of what makes it the ideal type of material for hiking, camping, backpack and other sporting equipment. It is also what makes it ideal for military purposes where it is used on uniforms, equipment, in transporting and in securing military supplies. Each inch of this type of webbing can typically hold between 3,000 and 6,000 pounds. Polyester webbing also has a low water absorption, which means that it won't stretch when it's wet, and it won't easily allow for the growth of mildew. It is also highly resistant to UV rays, so it won't damage because of them. This type of webbing can also withstand heat and other elements. It has a high melting point, which means that it won't easily become damaged from being in warm situations. This is especially important for backpacking, hiking and other outdoor activities in which the webbing might be in hot situations. Equestrian - Typically bit and bridle as well as saddles and tackle have traditionally been manufactured out of strips of leather. Leather, however, lacks the strength and durability of polyester webbing while also requiring frequent treatment and replacement. Leather also breaks expectantly making it an undesirable choice in most circumstances. In all ways possible polyester webbing is better suited for equestrian uses over that of traditional materials. Pet - Leashes and collars are the most common use of polyester webbing. However other uses include pet harnesses. Given the number of pets, pet use of polyester webbing ranks highly. Sporting Goods - Sporting good polyester webbing is used in a multitude of different activities and different ways. Given polyester webbing's superior tensile strength, durability, weight, and cost the webbing is used in diverse equipment and uniforms as well as across a full pantheon of sports. Outdoor - Outdoor uses of webbing include everything from the previously mentioned ports to also camping, hiking, backpacking and more. As webbing is essential in securing and transporting different equipment and loads, polyester webbing is used in numerous outdoor activities, most notably rock climbing. 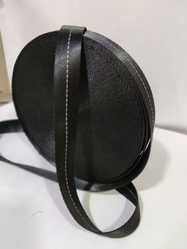 Handbags - Polyester webbing is used in handbags and fashion to increase the practicality of designer handbags. 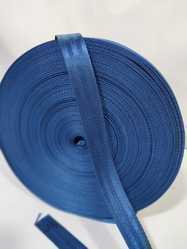 Typically polyester webbing is used in connection with other materials to increase the lifetime of the accessory given all of the advantages of polyester webbings. Luggage - Polyester webbing is a particular favourite of luggage as luggage is required to bear heavy loads, be durable, and reliable. The reduction in weight and the increase in tensile strength are key factors in polyester webbing's use in luggage. Military - Military applications for webbing are used throughout the military industrial complex from everything including uniforms, equipment, transportation, and securing. 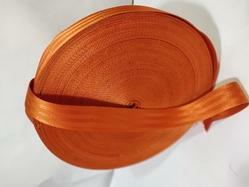 We are offering a wide range of Polyester Sling Webbing. If you need to lift or move several tonnes or more weight, our top quality Polyester slings webbing are perfect for the job. These high-endurance lifting Slings can handle weights of up to 30 tonnes, making them a great alternative to wires and chains, with the benefit of being flexible yet strong. 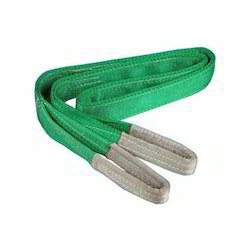 These polyester webbing slings or lifting straps are designed to bear heavy loads and lift them safely. Our lifting straps are designed to fulfil your lifting job without becoming damaged. A Polyester webbing sling is a lifting sling that is made by wrapping a protective polyester jacket around a series of tough load-bearing polyester yarns. This design results in a superbly durable product that can be used to transport immense weights in a safe and secure manner. it is extremely tough, yet lightweight, and its flexibility reduces shock while loading. We manufacture a variety of superior quality Black Polyester Webbing. Our polyester webbing are made with the objective of providing strength, extra protection and safety to the passengers. The belts can be customised in terms of width, designs, patterns and weaving to enable use in other industries. In Black Polyester Webbing we can give yarn dyed high tensity polyester webbing. We can give this branding as per customer requirement and make various kinds of pattern as per requirement. We can provide size ranges from 10 mm to 2 inch. Polyester Webbing Slings are much lighter and flexible so very easy to handle and rig. Polyester slings do not damage sensitive or delicate surface resulting in lower wastage. Polyester Webbiing Sling grips the load tighlty along the contourd of the load. Polyester Web Slings minimize the shock loading and can absorb heavy shocks withour any damage. Polyester Web Slings are colour coded for easy identification and thus chances of misuse are very less. Polyester Slings can be visually inspected quite easily thereby saving frequent inspection and proof load testing. 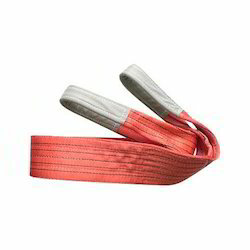 Polyester Webbing Slings do not rust or corrode and so do not weaken the edge. We are offering a wide range of Polyester Webbings for Que Manager.We manufacture a variety of superior quality polyester webbing. Our polyester webbing are made with the objective of providing strength, extra protection and safety to the passengers. The Polyester webbing for que manager can be customised in terms of width, designs, patterns and weaving to enable use in other industries. We are offering a wide range of Que Manager Webbing. We manufacture a variety of superior quality Que Manager polyester webbing. Our polyester webbing are made with the objective of providing strength, extra protection and safety to the passengers. The belts can be customised in terms of width, designs, patterns and weaving to enable use in other industries. 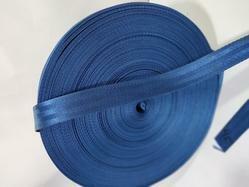 We are offering a wide Range of Sling Polyester Webbing. Looking for Polyester Webbing ?